She might have a whole running suit under her dress as some wear work clothes underneath when helping in the dairy. If you are talking about the main road, it is too fast and nothing but ditches on the edge, not a good move. That sounds really tough I can agree, I too am happy for all the running gear that I have. No fabric flapping around. Enjoy your day! I think that would take a lot of determination. It just goes to show that it isn't all about the fancy gear, but just a love of running. I think it would be really hard. I admire that she is so focused on wanting to run. I was never much for running but I liked to walk, especially with one of my dogs. But I am no longer able to do that because I need oxygen all of the time. That's interesting. Good for her! Wow that must be some sight. No way I could do run in a similar get-up. We live in an area with lots of Amish and Mennonites, and I applaud them for riding their bikes and walking in the frigid temps that greet us every winter. Wow. I give her a lot of credit for going after it anyway. Without making "adjustments." quite a few Mennonites and Amish around me. Haven't seen any jog other than going from one home to another. I'm thinking she is a determined lady who most likely doesn't see this as an obstacle. Me? I'm too spoiled….and I don't even run in running gear. It would take some getting used to, but I suppose I could with practice. However, running gear is much more comfortable! I think running in a dress would be uncomfortable, but when there is a will there is a way. 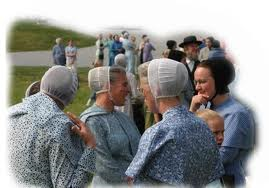 We have Amish in our community and they do everything in dresses and bonnets. Not many joggers, but the girls roller blade! i admire her resolve and her fitness activity. I am not one who runs, period! And to be a runner but in traditional GB clothing? No way! It's very admirable indeed. She must be very dedicated. Is German Baptist like the Amish? I'll have to look that up...never heard of them. Like you, I think the additional clothing etc. would make it a real challenge. She has great determination and apparently a real love of running. NOPE--- I would have a hard time running in ANY KIND of gear at my age with these crazy knees/legs... Think I'll stick to walking --which works for me. Love that photo of you running. Francie is definitely watching you! Nope running with all those clothes on no way! HAve a hard enough time running at any time...add all them lbs not likely! that is unless something is chasing me now we might be on to another subject....thanks for sharing had no idea that a Baptist strain wore this kind of ware. Now, THAT is some determination. I am very thankful for my technical running wear. No, I couldn't run like that. 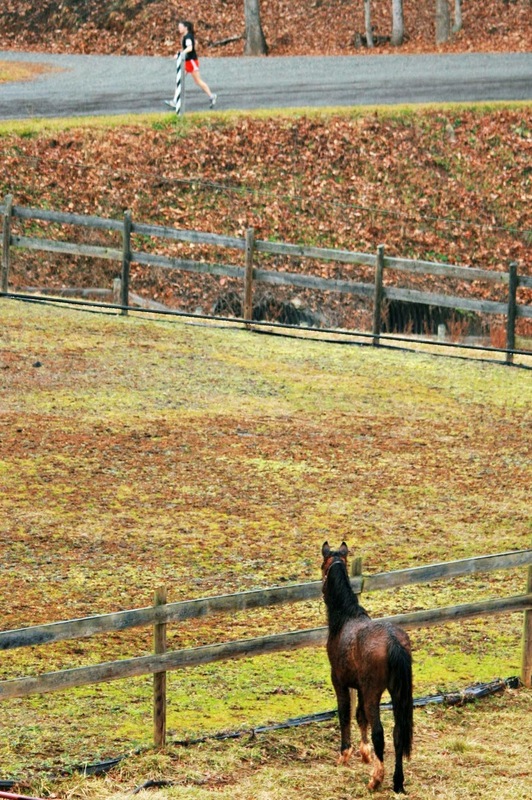 I admire her determination to run however she can. Is German Baptist like Mennonite? I love that photo of Francie watching you! So sweet. As a child I ran freely in whatever I was wearing from party dresses to dungarees. Now as an adult I need full running gear on to even contemplate going for a run. That sounds pretty bizarre. I wonder what those folks wear when they go swimming? That is very admirable! I don't think I could run in that attire. I adore that last photo! Wow, she must have amazing discipline. I admire her too! I am personally very grateful for modern conveniences and clothing. However, I do admire their strong faith. I don't run, I walk! Whew! Can't imagine the heavy baggage. Discipline, pure discipline. BTW, those babies are beautiful! I love that picture of you and Francie! And no... this is where I think strick adhereance to traditions should be overcome. And I use that word intentionally. I've watched Mennonite women riding bikes, loaves of bread in the basket. Looks difficult! determination is most important to over come such obstacles. I am sure she is reaping the benefits of running just the same. Although probably very uncomfortable. Sounds fun. I'd try it, and laugh at myself. I'm not a very good runner. I never thought about an Amish looking woman running before. Sounds like it would be a sight to see! lol I couldn't do it in that getup and I couldn't do it in the proper running gear either! lol I just can't run!